Imagine being one of the first to own property on Clear Lake outside of Graham, Washington. That was the story for one of the original homesteaders on the lake, and the extended family continues to have a deep love of the land and the lake. The homesteader’s grandson, a retired surgeon, sparkles and lights up when sharing his family’s connection to the lake. The grandson’s Clear Lake home was built by Scott Jamison of Rainier Excavating and Nelson T. Miller, a retired Seattle architect. The contemporary lodgestyle home boasts two-story beamed ceilings with windows open to the lake and Mount Rainier views. It is warmed by a soaring two-story stone fireplace. The homeowner hand made the beams and mantle. The chandeliers next to the massive fireplace are of forged steel. In 2015 the surgeon and his wife were introduced to Jamison’s childhood friend Juleen Pudists of Northlight Interiors. 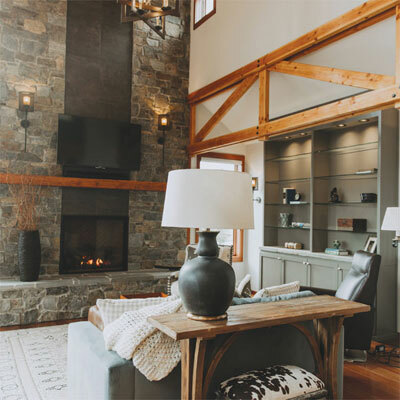 Northlight Interiors selected finishes, planned space, created the lodge-style fireplace, and provided cabinet and tile design throughout the home. Many of the home’s surfaces were handmade and locally sourced. These include indigenous stone, handmade tile, and local marble from a Pacific Northwest quarry. Wood and trim details were reclaimed from a Seattle mill. The vision for this home was to seize the connection with Mount Rainier and Clear Lake right outside the windows. The genuine stone fireplace reflects the rocks along the shoreline. The kitchen’s white marble has veins of green and blue mimicking the colors of the lake. Brazilian cherry floors and cherry cabinetry add warmth to the modern architecture. 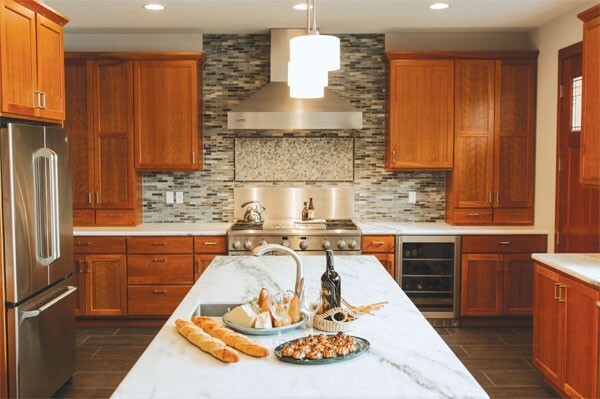 The homeowner boasts that Northlight Interiors made his kitchen perfect for his beloved wife, finding a space for a large pantry and detailing to fit their needs. The homeowners love to open their home to share with family and friends. It is bustling with lakeside activity throughout the warmer months.